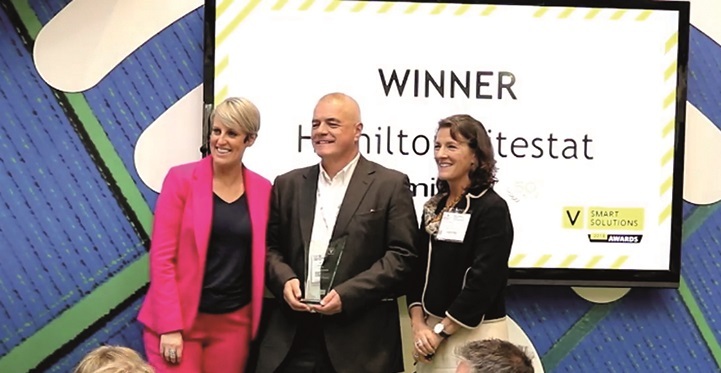 Hamilton Litestat was voted the Best Manufacturer 2018 at Voltimum’s Smart Solutions Awards, held on October 10 2018 at The Digital Construction Hub, UK Construction Week 2018, at Birmingham’s NEC. The accolade follows Hamilton’s investment in and promotion of the smart control sector over the past 18 months, with the brand working hard to dispel myths around complicated installation and programming through training, education and youth marketing activities. “The Smart Solutions Awards have always been our chance to say thank you to manufacturers’ hard work and to recognise their commitment to developing high calibre, highly skilled electrical professionals of the future,” said Rodney Jack, editor at Voltimum UK & Ireland Ltd. The master of ceremonies was the BBC’s Steph McGovern, and the award was presented to Steve Dyer, managing director of Hamilton’s PR agency, Oil the Wheels, by Margaret Fitzsimons, CEO of the EDA.